More about iittala Toikka Mirella 2012 Annual Bird Celebrate the 40th anniversary of Toikka Birds with the limited edition 2012 Annual Bird - Mirella. According to Professor Oiva Toikka, black and white are colors of “good taste,” so Mirella is made in the best of taste. 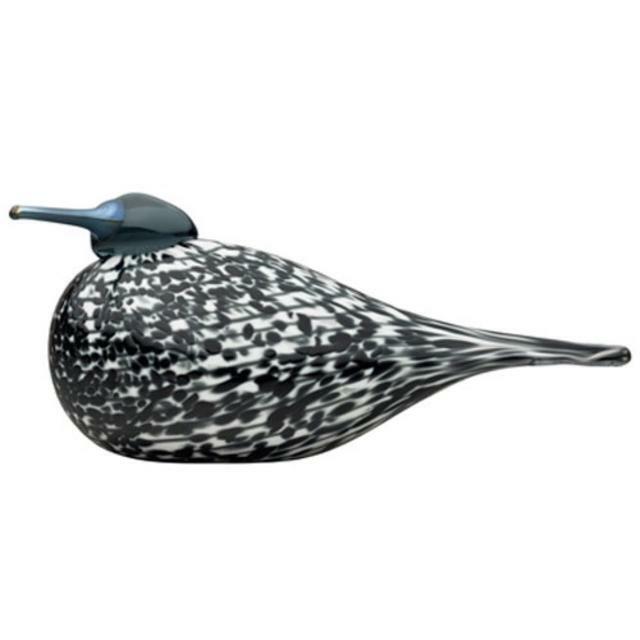 The bird is round and plump, but charmingly so, with its long beak and tail extending from either end of its rotund center like two proud points.Celebrate the 40th anniversary of Toikka Birds with the limited edition 2012 Annual Bird - Mirella. According to Professor Oiva Toikka, black and white are colors of “good taste,” so Mirella is made in the best of taste. The bird is round and plump, but charmingly so, with its long beak and tail extending from either end of its rotund center like two proud points. Created by rolling white powder onto a clear glass bubble, followed by a black glass band rotating around the bubble, the bird is all dressed up in its most formal attire. Black glass is added for the tail and gray glass for the head and beak.